Writing from Rawhide about my frustration on preupgrade when it comes for triple boot. I have Microsoft Windows XP (used for Flash development and games) on first HDD, Fedora 10 on second HDD on which Grub reside in MBR and the now upgraded Rawhide on third HDD where its grub is set at the beginning of its partition and preupgrade occured. I submitted a bug report and let hope that problem will be resolved as soon as possible. er... you don't have /boot on separate partition as is default in fedora? If you have it's probably only a problem of the partition not being mounted into the [awful-and-totaly-not-rememberable-hash]/boot. I am not sure about your case, but I usually dual boot Rawhide and Fn and have everything in one /boot. I just have to be careful not to format /boot during installation in order to not lost the kernel images... Of course grub.conf gets overwriten, but the old one is usually backed up in grub.conf.rpmnew or something. But I'm always doing fresh install so it might be different in your case. Yes I have separate boot on each dedicated Hard Disk drive. It turned out to be a bug from preupgrade installed on second HDD that will write boot on the first Fedora partition it encounters and there were no way to specifically assign installation. 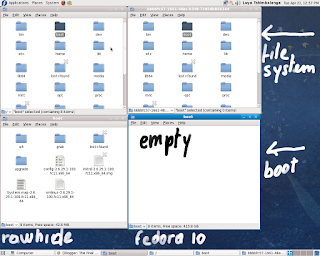 Fedora 10 has version 1.0.x and version 1.1.x that contains fixed issue just landed on test-updated. In case of triple booting, I assign second distribution (Fedora in this example) on first partition of third HDD where it will be installed and change the main grub.conf with (root and chainloader). The Raven Ridge APU is very capable processor to handle OpenCL inside some applications like Blender, Darktable and Gimp. Unfortunately, the current implementation from Mesa, clover, stuck to 1.3, is not supported. AMD released their driver 18.40 with OpenCL2.0+ targeting only Red Hat Enterprise Linux/Cent OS 6.10 and 7.5 in addition of Ubuntu LTS. The good new is the former rpm format can be used on Fedora. The graphical part of Raven Ridge is Vega 8, basically a cut-down of Vega56 or Vega64 meaning choosing either driver for RX Vega. kernel-devel (provided by Fedora repository)amdgpu-dkmsdkmslibopencl-amdgpu-proopencl-amdgpu-pro-icd Once done, applications needing OpenCL will automatically detect the driver located on /opt/amdgpu/lib64. Blender will list as unknown AMD GPU and Darktable will enable it. Revisiting the previous blog and freshly reinstalling Fedora Design Suite due to a busted boot, I look at the official guideline from AMD Driver for Red Hat Enterprise Linux 7.2 and write a way to improve the process of installing on Fedora 29 in this example. Last metadata expiration check: 0:30:51 ago on Mon 19 Nov 2018 07:13:43 PM PST. Upon closer look, the script failed to created a temporary repository on /var/opt/amdgpu-pro-local probably explaining why amdgpu metapackage name failed to display. Someone should investigate and provide a fix. At least, we find out Fedora support is available but unofficial. 03:00.7 Non-VGA unclassified device : Advanced Micro Devices, Inc. [AMD] Device [1022:15e4] That driver in question is AMD Sensor Fusion HUB. Unfortunately, researching it turned out harder even on AMD own website. Bug is already filed without answer yet from one of AMD representative.